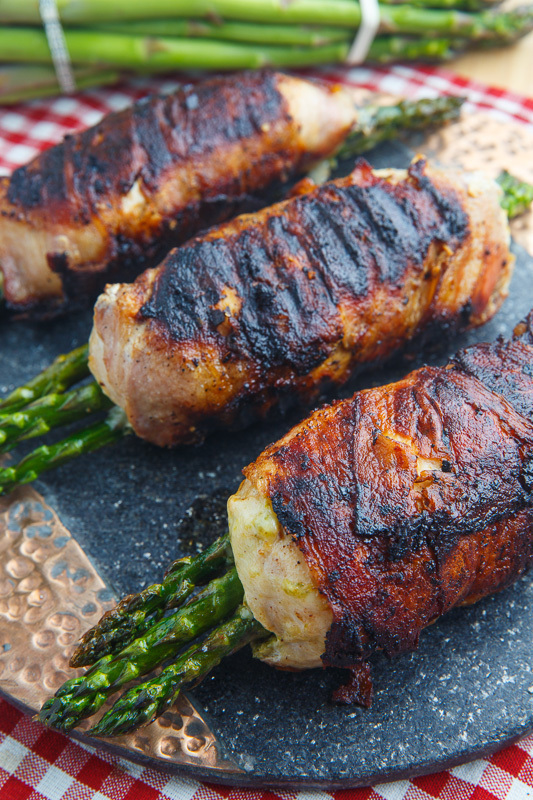 Crispy bacon wrapped chicken just stuffed full of asparagus, asparagus and pistachio pesto and oozy gooey melted mozzarella! 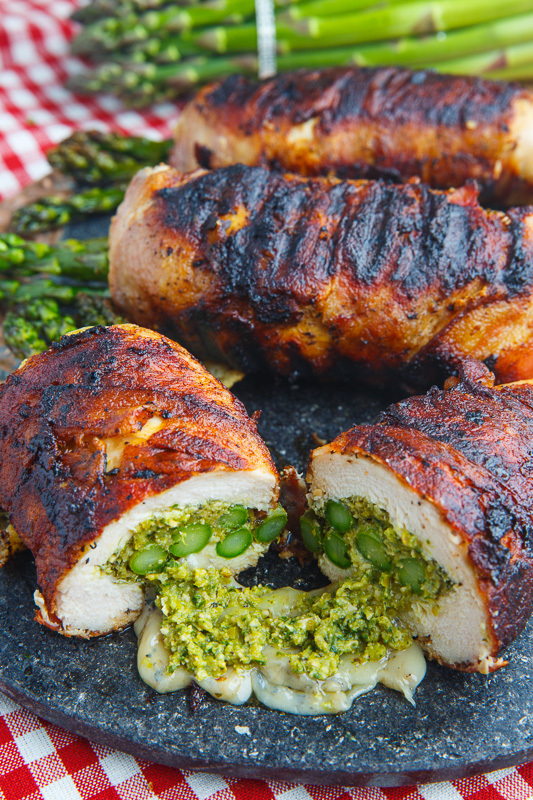 Alright, I’ve got time to share one more tasty recipe that is just perfect for Father’s Day and dad is just going to go crazy for this bacon wrapped asparagus, asparagus and pistachio pesto and mozzarella stuffed chicken! 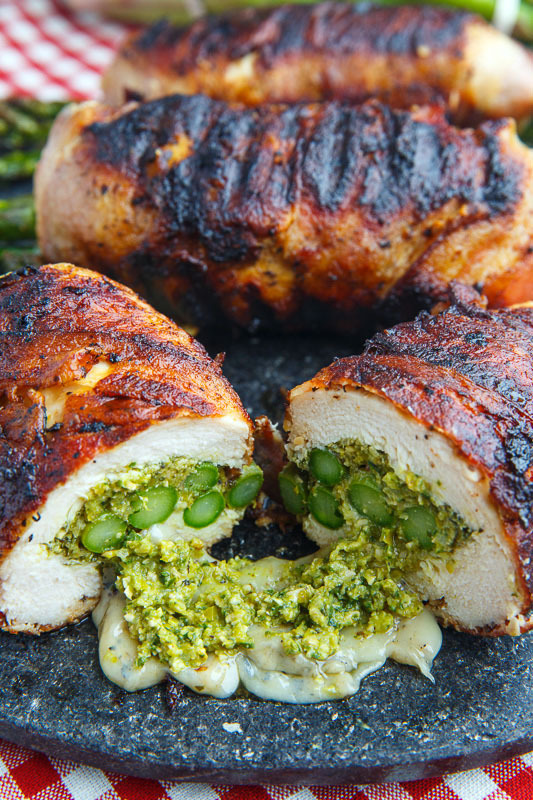 Stuffing lean and juicy chicken with things is always fun and for this recipe I stuffed the chicken with asparagus spears, mozzarella and pesto for a full flavour extravaganza! Asparagus just screams summer and it really needs no explanation, I am always in for ooey, gooey, melted cheese and pesto is another ingredient that is amazing with fresh summer basil. 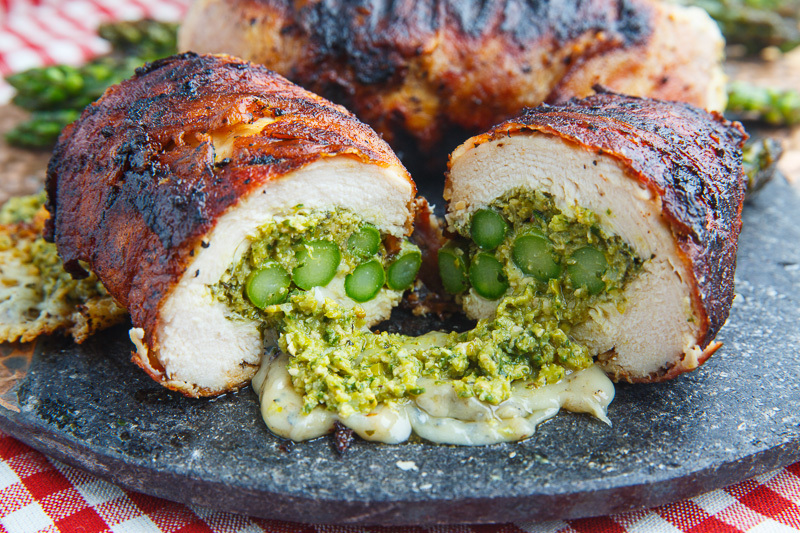 I did not use just any pesto for this stuffed chicken, I went with an asparagus and basil pesto and instead of using the more standard pine nuts I went with creamy pistachios! I like to indulge my bacon addiction here by wrapping everything up is bacon but there’s a good reason for it here. I’m serious! Wrapping the chicken in bacon helps keep the chicken nice and moist and juicy, because chicken can get dried out when cooked on the grill. Really, it has nothing to do with all of that salty, smokey, crispy, bacon-y goodness! It’s to keep the chicken moist and juicy! 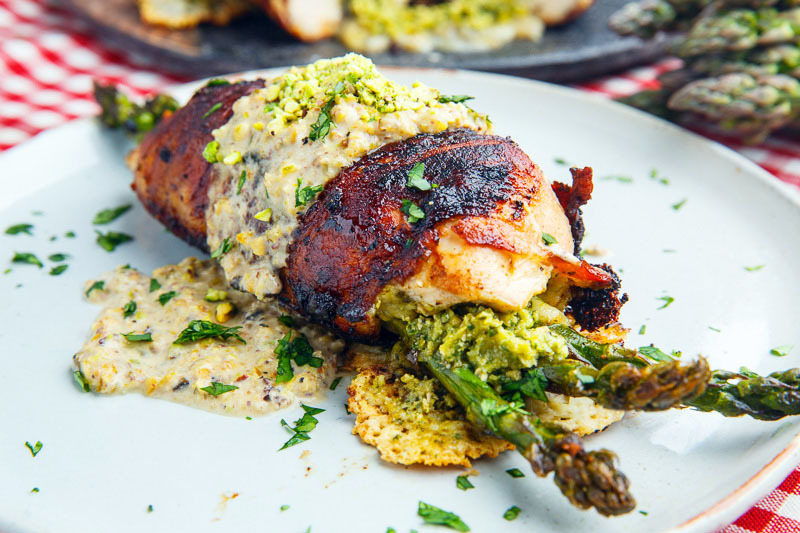 Anyways, no matter how you look at it, dad is sure to flip over this bacon wrapped asparagus, asparagus and pistachio pesto and mozzarella stuffed chicken this Father’s Day, or any day; for dinner, lunch or even breakfast for that matter! Yum!!! This goes great in a pistachio cream sauce! A light and fresh asparagus and basil pesto with pistachios! A fresh and creamy pistachio sauce! Toast the pistachios in a pan over medium heat until lightly golden brown and fragrant, transfer to a food processor or blender and grind to a fine powder, add the heavy cream and puree. Melt the butter in a skillet over medium heat, add the garlic and cook until fragrant, about a minute. Add the pistachio cream and parmesan and simmer until it thickens a bit, about 2-3 minutes, before mixing in the lemon juice and seasoning with salt and pepper to taste. This is right up Josh's alley! A great Fathers Day dinner! Such savory goodness! Prefect for a father's day meal! Great looking Father's Day meal! Love this!!! I bet this is SO delicious! Jeez, I'm gonna have to have a separate cook book just for your recipes I have made so many of them, including the Bacon wrapped Jalapeno Popper stuffed Chicken and the Bacon wrapped Guacamole Stuffed Chicken. They were both delicious! I'm looking forward to making this one soon!